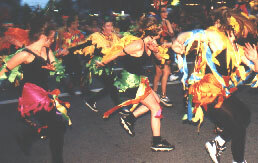 Samba OlyWa performs a number of dances and rhythms. Most of them originate in Brazil, with roots and influences from the Americas, Africa, and Europe. Here are simplified descriptions of some of our dances/music. Samba (from Wikipedia): Samba's roots come from Africa, mainly Angola, where the dance semba was a predecessor of samba, and as importantly from Portugal and Europe, which made it possible for the relatively intricate harmonies found in samba to be developed out of European tradition. Samba first appeared as a distinctive kind of music at the beginning of the 20th century in Rio de Janeiro (then the capital of Brazil), under the strong influence of migrant Afro-Brazilians from the northeastern state of Bahia. Samba Reggae (from Wikipedia): (pronounced HEH-ghe) is a hybrid type of samba from Bahia in Northern Brazil. The rhythm is influenced by Reggaeton, Calypso and Latin melodies. Coco (from AllBrazilianMusic): Traditional dance style from the North and Northeast, its origins are not clear: slaves could have brought it from Africa, or it could be the result of a mix between native and African cultures. Although more cultivated along the coast, coco might have appeared in the countryside, following the rhythm produced when the coconuts were broken so as to extract the neat. Frevo (from AllBrazilianMusic): dance-driven march played in a very fast tempo. The colorful parasols carried by frevo dancers represent defense weapons. Maracatu In order to effectively control the enslaved population of Africans brought to Brazil in the first half of the 16th century, Portuguese settlers encouraged the institution of black kings and queens, strictly ceremonial, but protected by Catholic fraternities. The coronation pageants are believed to be the origin of Maracat�'s frolic music. Bai�o (from Latin American Folk Institute): The Bai�o is a rhythm that, although not well-known outside Brazil, has enormous influence over much of modern Brazilian music. The traditional instrumental bai�o is a musical form based on an ancient figure dance or ballroom dance of European origin. In the northeast region of Brazil, Bai�o was played by local bands that performed in salons, at private parties, and at various celebrations. Ijexa is a rhythm that comes from Candombl� ritual observances of the African diaspora. The music, and the graceful dances that derive from it, appear in social, non-religious settings as well, such as Carnaval. Sometimes they are collectively known as Afox� (which term is also used to describe the groups that play Ijexa). In the terreiros (houses of worship in the Candombl� religion) of northeastern Brazil, Ijexa is associated with the father-god Oxal�, and also with Oxum, goddess of love and fresh waters.